High quality brushes are an essential for makeup enthusiasts. Not only do they last longer, but good brushes can make your makeup look more professional and can also make the process of application easier. Bristles tend to be softer and thus kinder to the skin, and you will probably be using them every day, making them an investment worth making. Here are our top makeup brushes. Zoeva This is a German brand whose core focus is makeup brushes. The makeup brushes are handmade using only vegan or natural hair as the bristles, ensuring a smooth application of a high quality. What I like most about Zoeva is that their complete dedication towards good quality brushes hasn’t compromised their ability to create brushes that are visually stunning too. You can buy their brushes singularly or in impressive sets, such as the popular Rose Golden Luxury sets which provide coordinating pouches, making them something of a statement accessory as well as functional tools. Most of their sets are reasonably priced, at approximately £50. B. Makeup B is a new cruelty-free makeup and skincare brand, whose offerings you may have seen in Superdrug. They are committed to ‘giving every woman the knowledge and tools to feel her most beautiful every day’, which is reflected through their pleasantly affordable makeup brushes. Singularly, their brushes range from £5.99 to £9.99 yet their quality mimics that of a more expensive brand. B. Makeup use silky-soft fibres which are tapered and shaped precisely. My favourite is the Finishing brush, as not all brands offer this style of brush, which is perfect for buffing and blending. Real Techniques This brand was created by Samantha and Nicola Chapman, who are top makeup artists, YouTube stars and widely regarded by many in the industry. Their makeup brushes reflect their level of experience through the sheer range of brush styles available. A lot of Real Technique brushes are multi-purpose which adds convenience and saves you a bit of money too. The Bold Metals collection is particularly striking because, unlike normal makeup brushes, these are weighted for optimal control and precision. The prices are mid-way between budget and luxury despite the quality being undisputedly high. EcoTools This cool brand are most notable for their ‘incredibly soft’ makeup brushes, and who take inspiration from nature and their ethos of being eco-conscious. 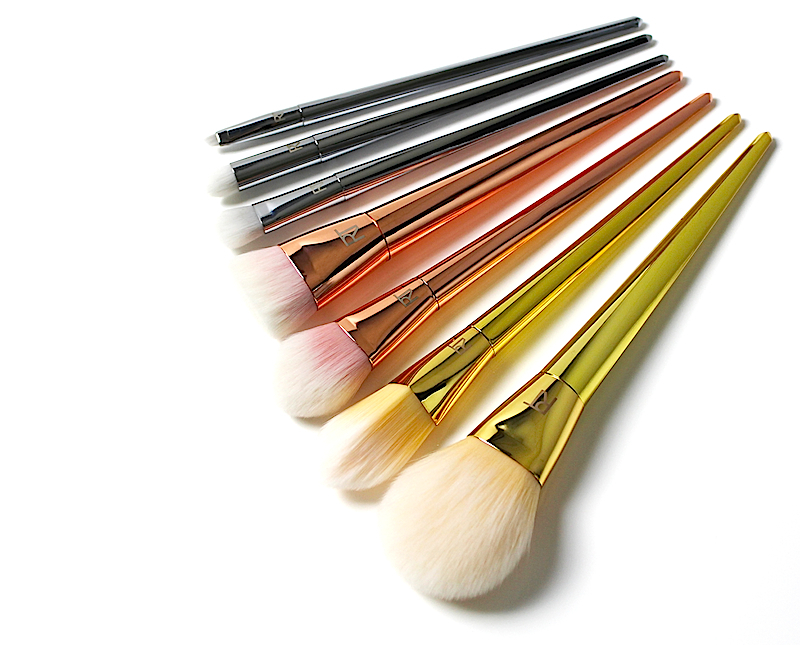 In keeping with these themes, the brushes have warm-coloured bamboo handles which look sleek and are ergonomic to use. The most interesting brush is the Foam Applicator brush, which uses a ‘beauty blender’ style head. The prices are wonderfully affordable, starting from £5.49 for single brushes. Bobbi Brown Now this is a brand which needs no introduction. Although perhaps better known for makeup, Bobbi Brown’s brushes are a favourite in the industry due to their unrivalled quality. They are the most expensive brushes than any I have mentioned so far, but I find them the best to use and a worthy investment to make. Like the above brands, Bobbi Brown sells brushes on their own or in sets. The sets are remarkably beautiful as much as they are practical, coming in deluxe sizes or mini sizes to allow for convenience on the go. The aesthetics of the brushes are exciting and usually coordinate with the beauty trends of the season. LAB2 This is a brand with a commitment to providing innovative and trend-setting makeup brushes of a top quality, but with a focus on affordability too. LAB2 have gone further than other brands by giving their brushes quirky names, such as the Beyond a Shadow of a Doubt brush, Don’t Get Mad Get Even brush and On a Powder Trip brush. As mentioned, the brushes are accessible and range from £5.99 to £11.99 for single brushes. I especially love the all-black look- brushes have never looked so sleek. Look Good Feel Better Now this is much more than a makeup brand, it is a worldwide cancer support charity, that has created a range of 12 professional makeup brushes, from which 8 to 12% of sales is donated to the charity. It’s a brilliant idea that those who are feeling socially responsible or charitable can make a difference by buying makeup brushes. The brushes are handmade and use super soft talkon bristles, which have been cut precisely and are allergy and cruelty free. This is a relatively affordable brand, with £14.99 being the most you will pay for a single brush. beautyblender Now this product has created a massive buzz over the last year and our Makeup Girl About Town, Anna Durston covered it in a previous post. Unlike the other brands, it does not come in a brush format but in the form of a sponge. It has been created to leave you with a professional finish and a flawless complexion. It is priced from £16.00 upwards. So there you are, now get blending!